A vacuum-insulated, double-walled stainless steel solution to one of life's minor annoyances. When it comes to keeping your beer cold and your hand unfrozen there’s no substitute for a beer koozy. You could rely on the classic cheap (or free) fabric options, maybe even that sick one you picked up on spring break in Daytona Beach. But just as your beer-drinking tastes have evolved beyond Natural Light, you beer koozy tastes can too. And the Asobu Frosty Beer 2 Koozy (or thermocooler, as they’re known) is better than traditional koozies in every way. 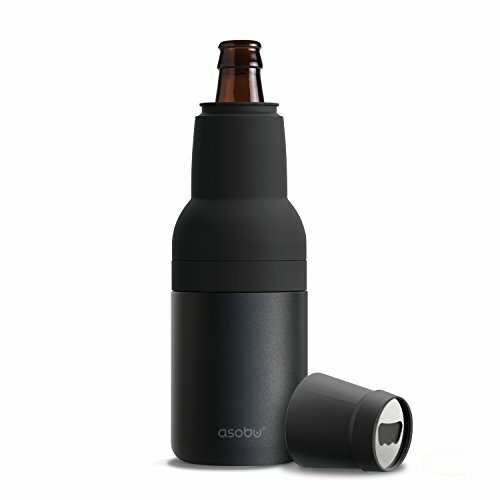 The Asobu is a vacuum-insulated, double-walled stainless steel container that insulates both bottles and cans. It sort of resembles one of those fancy, high-end water bottles everyone in yoga class seem to carry. If you’re enjoying a can, simply slide it into the standard koozy bottom. If you’re drinking from a bottle, do the same and then screw on the silicone sleeve that fits over the neck. Both setups allow for maximum insulation. A high quality beer koozy for grown-ups. There’s also an included lid that has a built-in bottle opener so you won’t have to rely on the old edge of the table trick, which, let’s face it, never made you look as cool as you thought it did. The Asobu is available in black, silver, camoflauge, and—our personal favorite—copper. It’s a great thing to take on vacation, particularly if you plan on drinking a cold one or two on the beach or next to a pool. And while we’ve been very beer-centric in our review, this thing works with any standard cans and glass bottles, so feel free to use it to keep that seltzer you crack at lunch cold through the afternoon.